Soft and fluffy Pumpkin Spice Donuts covered in a buttery, seasonally spiced glaze frosting! These donuts are baked, not fried, for a slightly lighter breakfast treat! Fall has recently become my favorite season: I love the weather, the color, and perhaps most importantly, the foods. Fall is all about cozy comfort food, and these baked Pumpkin Spice Donuts are precisely the right way to start off a crisp autumnal morning. Breakfast foods are some of my favorite to make, I love making my favorite chocolate chip muffins all year round, but Fall weather is perfect for making homemade donuts. For today’s recipe, I wanted to share some seasonally spiced donuts. Since Fall is also pumpkin season, what better way to celebrate than by infusing pumpkin into todays recipe, as well? 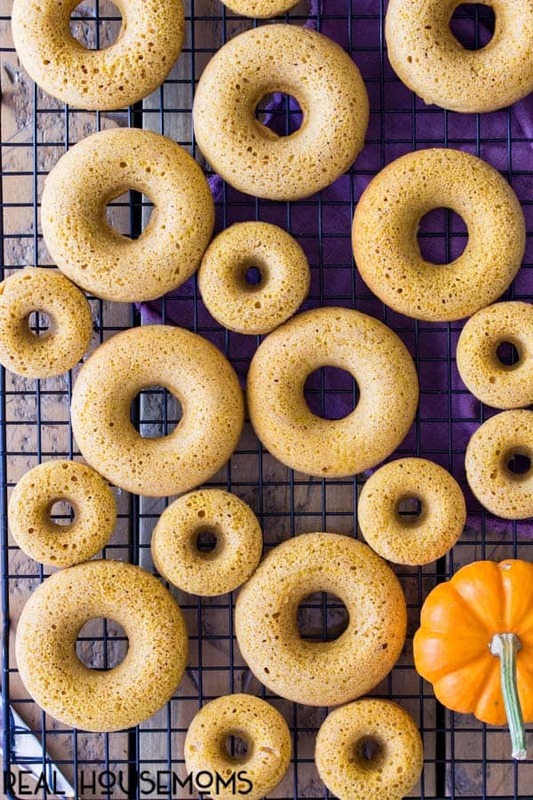 These pumpkin spice donuts are baked, not fried, and come together easily. They’re flavored with real pumpkin (make sure that when you buy your canned pumpkin you buy “100% pumpkin puree” and not “pumpkin pie filling”), which helps make them especially soft and moist. 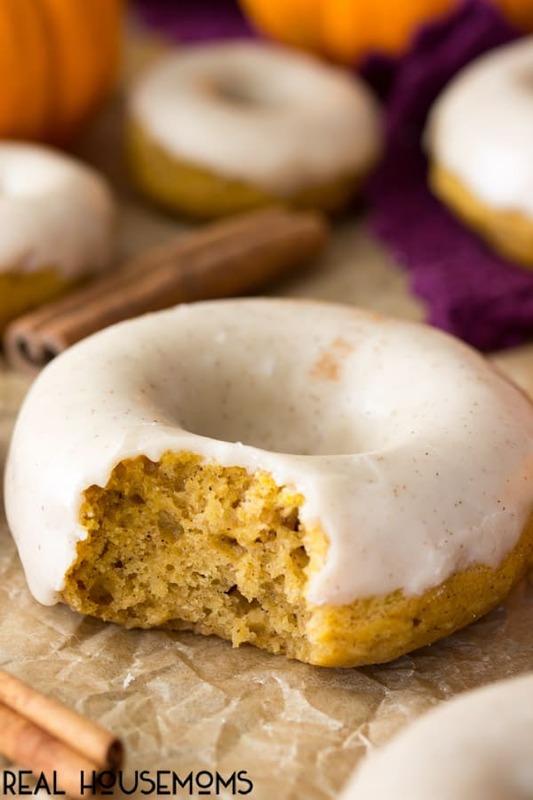 A sprinkle of pumpkin spice enhances the flavor for an irresistibly delectable donut. 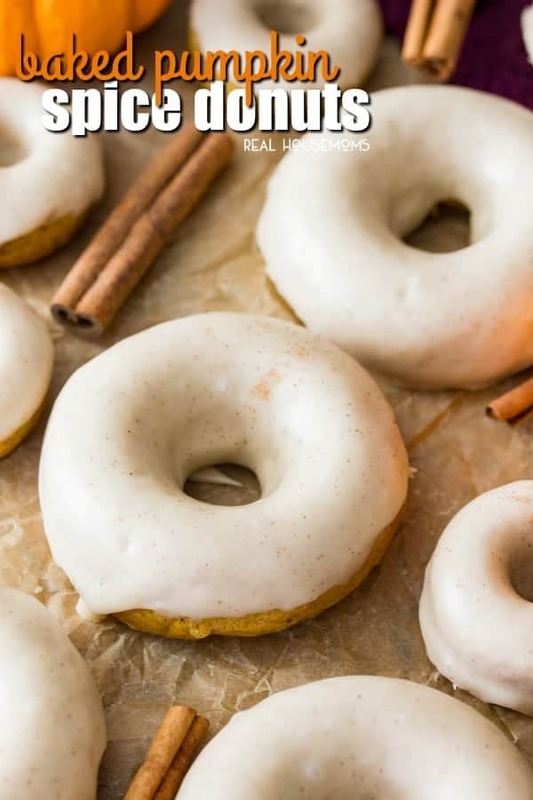 These donuts are then topped off with a buttery rich pumpkin spice glaze. The glaze is just 5 ingredients (and one of those ingredients is water!) and makes for a gorgeous and delicious shellac over each donut. Simply whisk together powdered sugar and pumpkin spice and then add melted butter, vanilla extract, and a bit of water to thin everything out and make it dippable. When dipping your donuts, be sure to invert them so that the smooth round bottoms become the tops — dip these in the glaze and place the glazed bottoms facing up so that they look neat and uniform (even if you dip the tops, they’ll still taste just as wonderful, though!). Donut Pan: My family LOVES donuts! Making them at home is a breeze with this donut pan. It makes 12 light and fluffy donuts at a time to make sure everyone gets one! Zipper Top Bag: My kitchen drawer is always stocked with zipper top plastic bags. They’re great for storage, but I find myself using them for everything from deviled eggs to frosting too! Preheat oven to 350F and spray a 12-cavity donut pan with non-stick baking spray. In a medium-sized bowl, whisk together flour, sugars, baking powder, baking soda, pumpkin pie spice, cinnamon, and salt. In a separate bowl, whisk together pumpkin puree and melted butter. Add eggs, milk, and vanilla and stir well. Add the dry ingredients to the wet ingredients, folding in carefully so as not to over-mix. Pour the batter into a large Ziploc bag and snip off the corner for a makeshift piping bag. Pipe the batter into the donut pans, filling each mold 2/3 full. Bake on 350F for 10-12 minutes. Allow donuts to cool for 5-10 minutes in their pan before carefully removing and allowing to cool completely on cooling rack. Allow to cool completely before frosting. In a small bowl, whisk together powdered sugar and pumpkin pie spice. Add butter, vanilla extract, and water. Stir until combined. Dunk each donut into the glaze and return to cooling rack. Allow glaze to harden before eating and enjoying.